WONDERFUL pumpkin! I love it! In Canada, being partly settled by the English, we find ourselves with differing timezones across the country when the Daylight Savings times begins in SOME of the provinces, but not all of them. Considering that there is already a two hour difference as the sun rises at different times across the country, the clock changing confuses it further! Ah, for a good old sundial! I've been counting and drooling over the shuttles - I'll blog and ask about times to list sometime this week!!!! I actually don't like selling them as it's like losing friends!!!! BUT when they go to other friends then I love it!!! Sometimes they even meet cousins. This time thing REALLY is confusing! We here in the US now wait until the first Sunday in November to turn the clocks back, but all year round I still have difficulty remembering what time it is in the different time zones. So I don't envy Jane's task! Brilliant tie-in of the clock and video (which are both ADORABLE). I'm sure that finding the missing leg was an emotional moment! The memories associated with an item like this are the reason it's so difficult to part with things! And saving the missing leg in the first place proves the importance we attach to everyday things. I have a feeling this cute clock is going back into the 'save' pile! We don't have Daylight Saving in Quensland, despite calls for it to be introuduced, at least in the Southeast. But it would probably mean having two timezones in one state, since the area is so vast. I'm really hoping to buy a hooked shuttle this time! I forgot to mention the wonderful tatted pumpkin teapot! 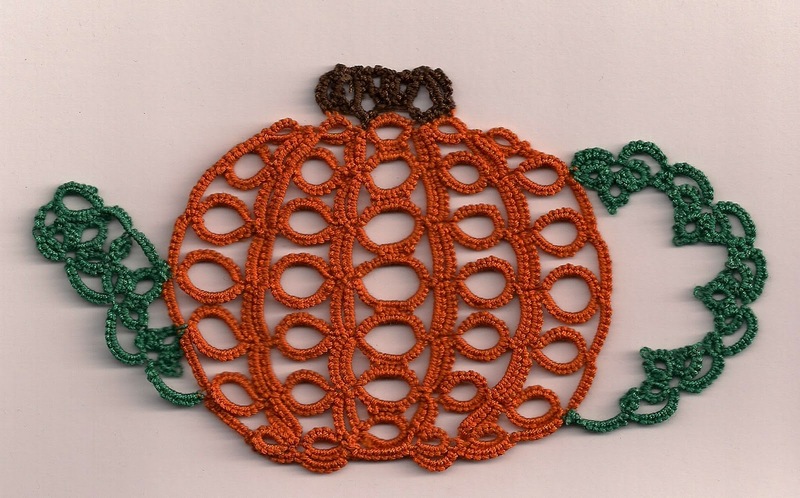 What a fabulous pattern, and excellent tatting! As Kathy said, we have to wait yet another week for the time change! I absolutely hate DST anyway. We didn't have it for decades until someone pushed it through a few years ago and now we are even more confused. Not all of Indiana is in the same time zone to begin with. Besides, when you're tatting, time is nonexistant! the little clock is cute! Goodness thought we were bad in little old England but you folks really have a time problem. Thanks also for the compiments about the pumpkin teapot I actually started it weeks ago and then lost it and then it was found in an odd place. Kathy you are so right the clock is saved and will stay with us, some things you can't part with. Maureen I hope you are lucky and the Jane's timing is right for you. I'm so glad my province doesn't do the whole DST thing. Probably won't have to either. Very pretty teapot. If Jane's looking for listing time suggestions, I have one. How about 6:00 pm her time. That would be noon my time, and between 10-2 for the rest of the continent. Her previous listing times had me up at 6 or 7 in the morning and as early as 3. Is there just one olive wood shuttle? I've been waiting for one ever since I first saw it. Its nice to have the extra hour in bed, but when March comes and we lose an hour, I feel tired for days. I love your teapot, great design and colour.